Three paper origami cranes were packed aboard the Japanese cargo ship Kounotouri 2 before being released to burn up in the Earth's atmosphere. When an unmanned Japanese cargo ship ends its mission in a fiery blaze in Earth's atmosphere tonight, it will be carrying a few tokens of sympathy for earthquake victims in Japan: three paper cranes from the crew of the International Space Station. Nick Ivanov works near new additions to the ADCO console in the space station flight control room in Houston's Mission Control Center. Several flight controllers placed the cranes on their consoles. The art work was displayed at mission control centers in both Houston and Japan and onboard the International Space Station in order to honor the people who suffered in the wake of the March 11 earthquake and tsunami in Japan. The cranes were folded by the space station's three-person crew and packed aboard Kounotori 2, a robotic Japanese cargo ship before it departed the space station yesterday (March 28). The astronauts made the origami cranes to honor the thousands of victims of the massive March 11 earthquake and tsunami that devastated northeastern Japan. They snapped photos of the cranes before packing them on Kounotori 2 spacecraft. JAXA, Japan's space agency, is a major partner in the $100 billion International Space Station project. In addition to the Kounotori (which translates to "White Stork" in English) cargo ships used to resupply the station, Japan built the orbiting structure's largest laboratory, called Kibo ("Hope"). Last week, JAXA officials reopened the Tsukuba Space Center – home of Japan's mission control centers for the space station and Kounotori flights – for the first time since the March 11 earthquake. The center suffered some damage during the temblor and was evacuated. On Monday, paper cranes also decorated the Kounotori and space station control rooms at the Tsukuba center to send a message of hope to the people of Japan, NASA officials said. 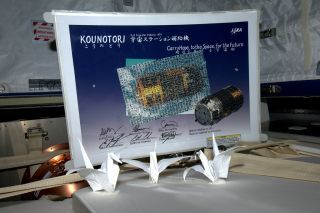 Three paper origami cranes were packed aboard the Japanese cargo ship Kounotori 2 (HTV-2). "The ISS crew's heartfelt concerns and wishes have spread to the ISS partners, NASA, ESA and Russia. People at those agencies began to make paper cranes wishing for the early and successful restoration in Japan," JAXA officials reported. Kounotori 2 is Japan's second disposable H-2 Transfer Vehicle (HTV) to visit the space station and will be intentionally destroyed in Earth's atmosphere now that its mission is over. The spacecraft launched in late January and spent two months docked at the space station, where it delivered more than four tons of supplies and equipment. Astronauts packed it with 3,135 pounds (1,422 kilograms) of trash, foam packing material, food containers and other unneeded items before setting it loose yesterday. "It brought an amazing amount of supplies that were very much needed here on the space station," station astronaut Cady Coleman of NASA told Mission Control as the cargo ship departed. Coleman said the craft's departure marked the end of a "very productive time for the Japanese supply module Kounotori and an excellent, excellent demonstration of robotics in space for our team down there." Station astronauts used the orbiting lab's robotic arm to pluck the Japanese cargo ship free from its docking port yesterday. Today, Kounotori 2 is expected to fire its rocket thrusters three times in maneuvers designed to force it from orbit. The spacecraft is a gold-colored cylinder about 33 feet (10 meters) long and 14 feet (4.4 m) wide. It is designed to fly itself to the space station and be grappled by robotic arm and attached to the orbiting lab so astronauts can unpack cargo from its interior and from an external pallet. If all goes well, the Kounotori 2 spacecraft should encounter the Earth's atmosphere tonight at 11:09 p.m. EDT (0300 GMT March 30) and burn up over the Pacific Ocean. Japan's next HTV spacecraft is slated to launch in January 2012. In addition to trash, the Japanese spacecraft is also carrying a special sensor package to record temperature and other data of the descent through Earth's atmosphere. The so-called Re-entry Breakup Recorder will measure temperature, acceleration, rotational rate and other observations, then pop free and relay the data to Earth via a satellite link before also being destroyed. The project is a NASA-run experiment to better understand the extreme environment spacecraft are subjected to during re-entry.